MyShot Underwater Photo Contest 2016 is open to all photographers shooting with DSLRs/mirrorless or compact cameras. Main categories comprise Macro and Wide Angle. There are special categories for snorkeling and wrecks. Maldives liveboard; Week of diving in Maldives; Week of diving in Sharm Sheikh. Dive equipment by Decathlon, Aqualung and Scubapro. Vouchers for photo equipment by Isotta, Nimar and EasyDive. Please read the complete guidelines carefully. Entrants who participate in the contest (submitting at least one photo) accept the rules and guidelines. By submitting your photos, you accept the rules, and the fact that the organizers can change them at anytime. Each photographer can submit one image or video in each category for every MyShot token. Tokens can be purchased below (via PayPal) : 1 token: Euro 10,00 ⏐ 5 tokens: Euro 35,00 ⏐ 10 tokens: Euro 50,00. Holders of the Dive Card can submit an image or video for free in each category. Privacy: Data will be treated according to Italian law. Dimensions: Minimum 1800 pixels along the longest axis (upscaling not permitted). "John Brown" submits a macro image taken with a DSLR. The category is thus "Reflex Macro" and consequently the file must be named: John_Brown_RM.jpg. The entrant certifies that the work as his or her own, and acknowledges that the ownership and copyright for all submissions is the exclusive property of the entrant. Images in digital format may be entered by a contestant who is the original author of it. Each individual image may be entered in only one category. Photos must be submitted by midnight (CET) October 7 , 2016. 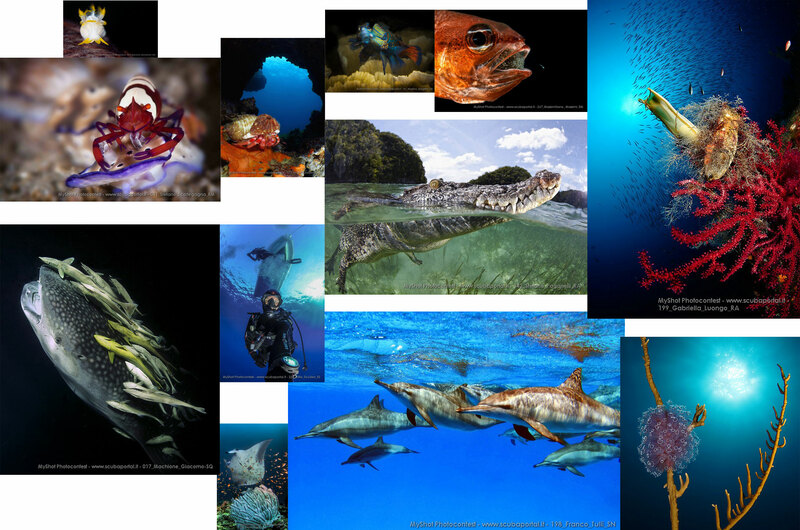 MyShot is an online underwater photo competition. Photographers may submit their images until the stated deadline. The jury will decide the winners of the categories and there will be a public vote as well for a selection of 100 photographs (25 each category). A final party will close the contest. Each entrant can only win one award. In case of multiple wins, the entrant will be awarded according to the following order of preference: reflex macro, reflex wide angle, compact macro, compact wide angle. The awards will be presented at the award ceremony, held in Milan Castle in Binasco, Italy on Saturday 22nd October. International winners who are unable to attend in person will receive their award by courier. Winners must provide the winning photo in a high resolution file (RAW or JPG) to the organizers before the award ceremony. The entrant certifies the work as his or her own, and acknowledges that the ownership and copyright for all submissions is the exclusive property of the entrant. Entrants, by submitting images, grant permission to the organizers to use the images for any future need. Organizers may show the competition entries on their web sites. All rights remain with the photographers. Winners must submit the winning photo in a high resolution file (RAW or JPG). The organization keeps the right to reject any submissions deemed not to be original work or copied from any source. The organizers, jury members and their relatives are not eligible to submit photos. Marine life may not be stressed or endangered. A photo will be disqualified if it shows a diver who is damaging the environment. Aquarium shots or any shots that are not natural are inadmissible. Rules and guidelines can be changed any time, if necessary. Cropping is allowed, maximum 25% of the original image area.